Click on any link that has a double underline to see a picture that we took related to the text. It's worth it! To view the pictures by themselves (and larger versions of the pictures) choose the pictures link above. 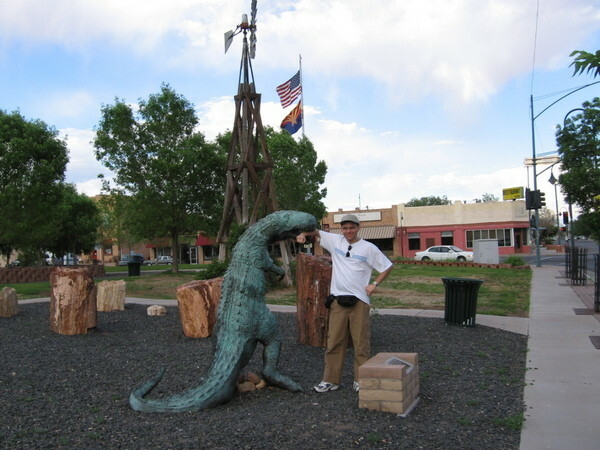 May 16, 2006 Got into Elk City last night. We were checking in when Larry came by, horn blaring. He was going to go to the state line before stopping. Predicted that we would pass him this morning. We got into the KOA and Bob talked to us for a bit (6:30am departure planned). We then got our packs out and were ready for sleeping under the stars. Some people showered (not I). We chatted for a bit, and ended up going to bed around 10:20. Took me a while to get to sleep. Woke up several times. I had the alarm set for 5:35, and it was still pretty dark when that occurred. I got up, showered, and was getting my sleeping bag, etc ready when Bob came through and woke everyone up. We got on the road at 6:30 exactly, and the sun was touching the horizon at that point. We are going to stop for breakfast in a couple of hours. Song called Lucky, "Lucky, the Chinese Man" last night. I found it very funny. 7:40am. Larry called. He was behind us. We are at the 142 (in Texas), and he was at the 16 in Oklahoma. About an hour behind. 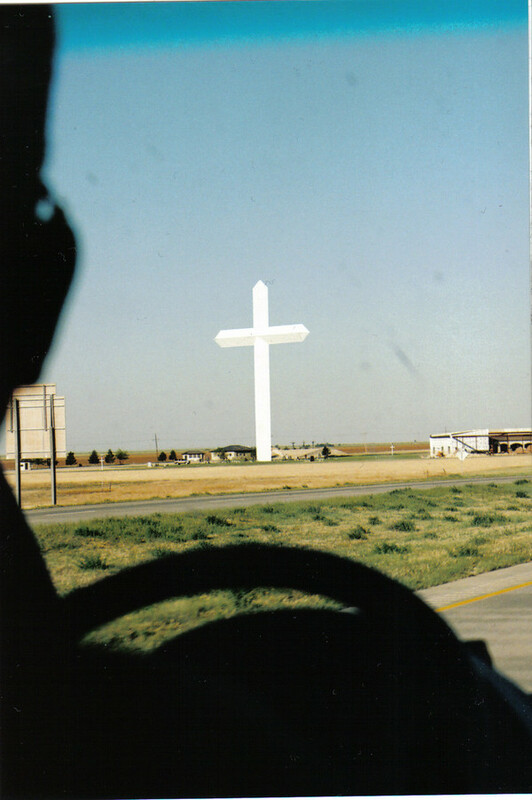 We passed The Cross at Groom. We could see it from 12 miles away. We stopped at a Walmart in Amarillo to get the spare tire fixed. They didn't have the size we needed. I went into Walmart and bought ear plugs and a watch. They didn't have the foam earplugs, so I had to buy some more expensive ones that are made for shooting. I just wanted something to block out background noise while I was trying to sleep. And, I stupidly bought a watch without an alarm on it. They had some clearance watches for $7, and I happened to choose one without an alarm. Brilliant. After Walmart I went to McDonalds across the parking lot and got a breakfast burrito. 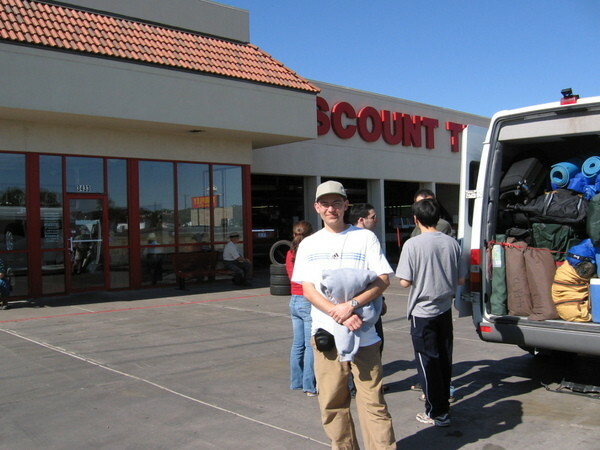 We then piled back into the van and went to Discount Tire (the lady at Walmart told us about it) and we got the tire fixed. We left Amarillo at 10:14am. We stopped at a Carl Jr's in Santa Rosa, New Mexico for lunch and gas. I got a BBQ Chicken Sandwich combo. Larry is now 70 miles ahead of us. I don't expect to see him again on this trip. Passed through Albuquerque. It looks hot outside. 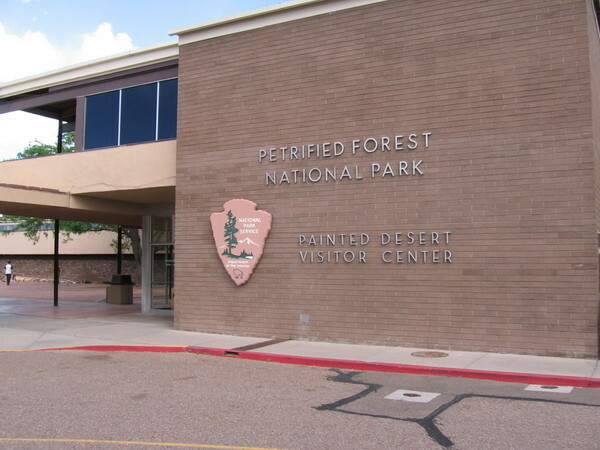 We stopped at the Petrified Forest visitor's center. For my National Parks passport (which I left at home) I stamped a piece of paper. 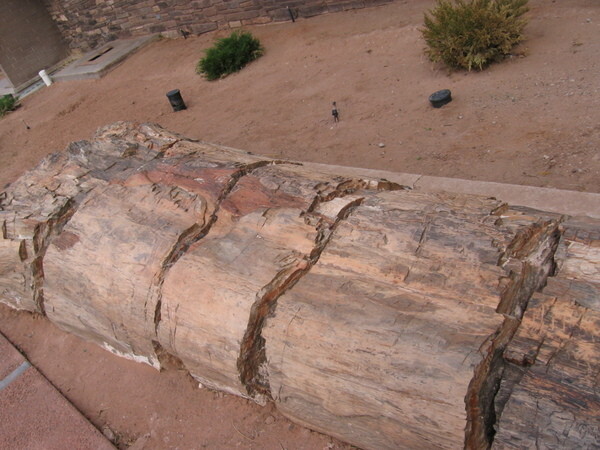 We then went into Holbrook and stopped by a rock store, where I bought a $6 piece of petrified wood. We then ate at Joe & Aggies. It is a Mexican place that is the oldest restaurant on Route 66. I had a taco and tostada. I bought a t-shirt. The restaurant is going to be in the movie Cars which is coming out in June from Disney/Pixar. We took some pictures outside of the restaurant. 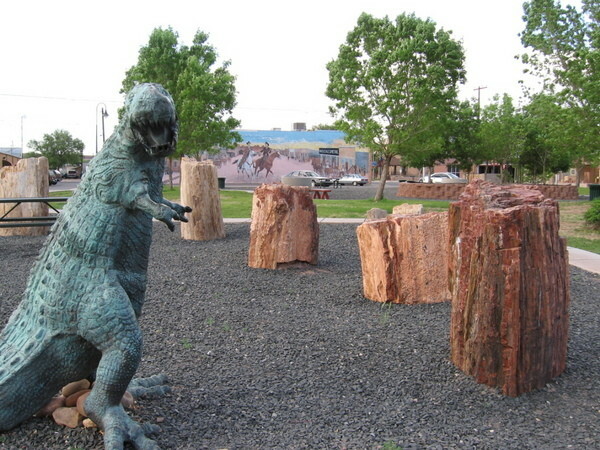 There was a little dinosaur park across the driveway from the cafe that some felt compelled to explore. We stopped in Flagstaff at the Safeway to pick up some breakfast food. We then stopped across the parking lot at a gas station and got some fuel. Heading south, we wound around a road for a while as we were looking for the national forest, got to a gate that Bob recognized, opened it, pulled in, got out, found a smooth spot under a pine tree, set up camp, and went to bed. I wore socks and the stocking cap to bed. Did pretty well. Woke up a few times, but not bad.